Gallery Eleven, a co-operative of member artists, features a variety of their paintings and other works of art for sale.The pieces range in price, media, size and subject matter. Other fine art items by WV artisans are handled on consignment including pottery, baskets, stained glass, hand-crafted glass, clay, jewelry, note cards, and fabric or stone sculptures. Gallery Eleven was started as a co-op 38 years ago in June of 1975 by 11 artists in a small room on the 2nd floor of the Noyes Building at teh corner of Broad (now Leon Sullivan Way) and Quarrier Street. The rent was $50/month and hte artists paid quarterly dues to pay the rent. The Noyes Building was torn down in in 1989 and the Gallery moved to 1033 Quarrier Street. This building was closed and all tenants had to vacate. ON the 31st day of August, 2010, Gallery Eleven moved into the Ground Floor of the Medical Arts Building at 1025 Quarrier Street near the historic Quarrier Diner. Gallery Eleven is open M-Sat 11am to 5pm. 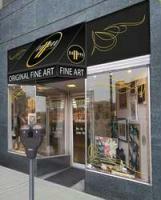 Gallery Eleven accepts VISA, MasterCard and Discover Cards. The co-op also makes layaway arrangements. To join the Gallery Eleven co-op, you must be juried in and approved by teh current members. All members work atleast two days per month and have other assigned duties as well. Dues are on a quarterly payment schedule.